Group Meals Are an Essential Part of Any Group Living Environment. Whether in a therapeutic or purely social setting, providing the right furniture to make dining comfortable for consumers as well as functional for staff takes a bit of planning. Rest assured there are many tried and true ways to set up your dining space regardless of the size of your group or the limitation of your consumers. Focus first on the dining surface. Ask yourself about the frequency of dining and alternative uses for the designated dining space. If you have a dedicated dining space that is used daily for multiple meals then dedicated dining furniture will be a priority. If, on the other hand, meals are offered on a more occasional daily then more flexible, multi-use furniture is likely a better choice. Laminate top tables are a typical choice since the laminate adds a durable, scratch and stain resistant surface that maintains a consistent look over time. Wood top tables add additional warmth and can be the right solution for a space inspired by nature and warm tones. More flex-space options include folding tables and folding chairs Molded plastic, resin and blow molded tables are light weight and can be used easily in both indoor and outdoor spaces. Mobile folding table with attached seating are also a classic option that provide sturdy, convenient and flexible dining options that fold and store quickly. Build your own table is a line of tables that offers you numerous choices of: Tops, Base, Sizes, Colors, Finishes & Edges Options. 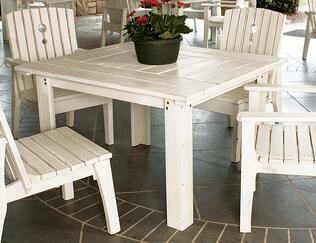 Outdoor Tables & Chairs come in adirondack styling, metal and recycled plastic. 2. Seating is perhaps the most challenging aspect of the dining equation. Folding and stacking chairs are a perfect option for occasional dining or mixed use spaces. Stack chairs come with or without arms and with or without padded seats. Stack chairs are by far the most flexible, attractive and comfortable of all the flexible storage dining chair options. But, even folding chairs can be a great option. Newer designs in folding chairs include sturdy & attractive wood frames with choice upholstered seats and backs for an attractive and comfortable folding chair option. Upholstered chairs offer the highest comfort for dining. Many variations of upholstered dining chairs are available to make getting in and out of chairs easier for consumers and guests. For example, casters on rear chair legs only allow staff to easily assist individuals with limited mobility while stationary front legs ensure support and stability. Fluid resistant fabrics are readily available and growing in popularity for dining. The fluid resistance not only helps repel stains and spills, but also prevents body fluids from penetrating and ruining upholstery and other chair components. Arms on dining chairs can provide a leverage point to enable consumers to stand on their own without applying pressure to table that can easily tip. Upholstered chairs with firmer foam and spring units prevent consumers from sinking too far into their seats thereby aiding them in getting back to a standing position. 3. Planning seating around dining tables to maximize the use of space yet make consumers and guests comfortable takes a plan. A typical dining seat is 20” wide but that width varies based on the type of chair. Seats can be arranged in a tight or roomy manner. In a tight dining environment chairs should have at least a 2” of distance between them. In a roomier plan, chairs should have at least 6” of distance between them. For example, a 6’ long rectangular table (72”) would allow 2 chairs on either side (plus 1 chair on each end for a total of 6 chairs) in a roomy seating plan, but would allow 3 chairs on either side (plus 1 chair on each end for a total of 8 chairs) in a tight seating plan. Regardless of the frequency of dining, shared meals are integral parts of any group living, therapeutic or healing environment. With some preparation and planning, dining furniture can be an asset. 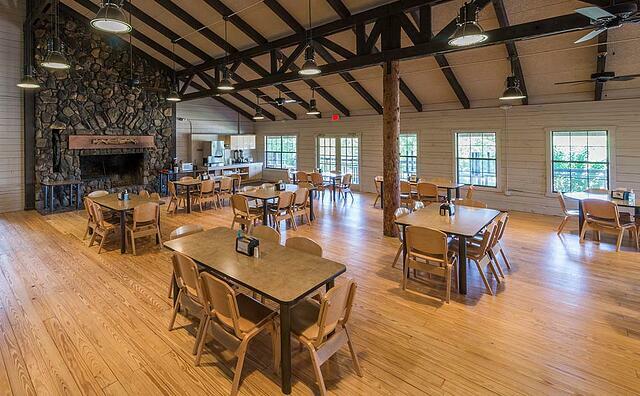 While comfort is a key component, creating a practical and functional space that meet the needs of guests, consumers and staff is a critical element of your facility plan.